What is solder wick? Solder wick (also called de-soldering braid) is an essential tool at the electronic bench where printed circuit board (PCB) prototyping, repair and rework are performed. Zephyrtronics Solder Wick is fabricated from high-density, oxygen-free and individual copper strands that are precision-braided and treated with pure, Type R rosin flux for the fastest capillary or wicking action as solder melts, so the solder is wicked up and off the pins or leads on PCB components. Many Applications! Whether you are soldering or de-soldering PCB's for military applications, high-reliability aerospace, computers, laptops, televisions, cell phones, game consoles or in most every electronic application, you will quickly recognize and appreciate the rapid, capillary-action speed. Zephyrtronics Solder Wick also safely removes unwanted solder bridges between your chip's leads or excessive solder left on your PCB and can be used with flux to carefully clean up BGA's after desoldering. from SMD's & Thru-Hole components. Conveniently Coiled. Easy Dispensing static dissipative (ESD-Safe) spools. Each spool contains 5 feet or 152cm of our premium fluxed, oxygen-free braided wick and is RoHS compliant for Lead-Free soldering applications. Why Type-R Rosin Flux? Zephyrtronics only markets wick with Type R rosin flux for good reasons. Why is that? 1.) It has history! There's just nothing, in our opinion, with such a proven record of over 50 years with PCB's like Type R. 2.) Highly Active for Tough PCB Work: A significant and common challenge with desoldering PCB chips is that the board or components have been "in use" and exposed to the elements. Many times, PCB's are barely even solderable and achieving a "wetting condition can be difficult. This is why and where our Type-R is so handy. 3.) Type-R flux: A real "heat conductor" that transfers any applied heat from a soldering iron or a hot air tool directly to the soldered pad, lead or joint making it even more ideal for lead-free solder applications. Don't Take Chances With Your Wick! It is hardly any secret that there are a lot really tough applications where older PCB's are being reworked or where a lot of oxidation has taken place on the pad/lead interface. In such instances, the limited amount of flux that is typically within your de-solder braid just may not be sufficient. For decades savvy technicians have dipped their wick/braid into additional flux before applying the wick to the PCB to compensate for the lack of flux within the braid to "do the job". After all, there's only so much flux that can be impregnated into the stranded copper braid by any wick manufacturer. That's just a stark fact. 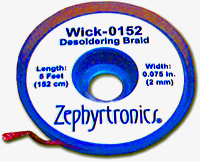 So, while Zephyrtronics is a big fan of no-clean fluxes (which is why we market no-clean fluxes), our collective experience has shown us that when it comes to only the specific use of de-soldering braid (or wick), it's just best not to take chances with under-powered fluxes within the braid itself. 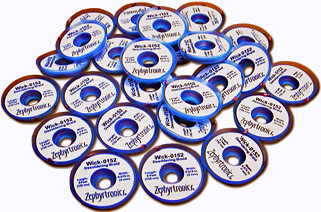 For this reason, Zephyrtronics only markets wick with the more aggressive Type-R rosin flux which has a proven history of over half a century at the electronic bench. ©1996 - 2011, 2012, 2013, 2014-2016, 2017, 2018, 2019 by Zephyrtronics®. All rights reserved. The information, text, images, photographs, charts, graphs you receive online from Zephyrtronics® are protected by the copyright laws of the United States. The copyright laws prohibit any copying, redistributing, retransmitting, or repurposing of any copyright-protected material. Zephyrtronics is the registered trademark property of JTI, Inc. "The Science of Zephyrtronics" and "Simplicity Through Innovation" and "Zephlux" and "ZeroLead" and "Zero Balling" and "Zero Residue" and "Post Cooling" and "Post Cooler" and "AirBath" and "SolderGlide" and "SolderMill" and "ZeroTouch" and "Just So Superior" are the protected trademark property of JTI, Inc. "Zephyrtronics" and "Low Melt" and "Air Fountain" and "Fountainhead" are the registered trademark properties of JTI Inc. *The above names are the registered property of their respective owners.